Still remeber Anis from Kertas Puteh? She ordered her mom and dad's birthday cakes from me and now her own wedding cake. Mom and I am so touched with her support. Anis is a designer herself, I guess so, hahah, her creations are simple, clean and yet leaving a lasting impact. I like them very much! It was always a challenge for me to fulfill her requirement in cake decoration, ha! Luckily she used to give me a clear reference on the cake she wanted. 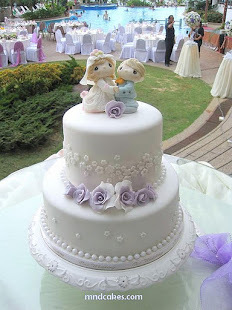 The cakes she like are clean with minimal colour combination, looked simple but not really in implementation, just like this wedding cake with 3 tiers of plain white body and a huge ball of ribbon roses in purple shades on top. Firstly, purple food colour faded and changed to bluish when exposed to sunlight. So, I could't use the colour directly but to mix blue and red to obtain purple. Secondly, the white body square cakes, I needed to make sure they were clean with sharp edges. Thirdly, the big ball! It was my first time doing a flower ball in fact, how would I stick the flowers on it? How big the ball should be? How many pieces of ribbon roses should I prepare? 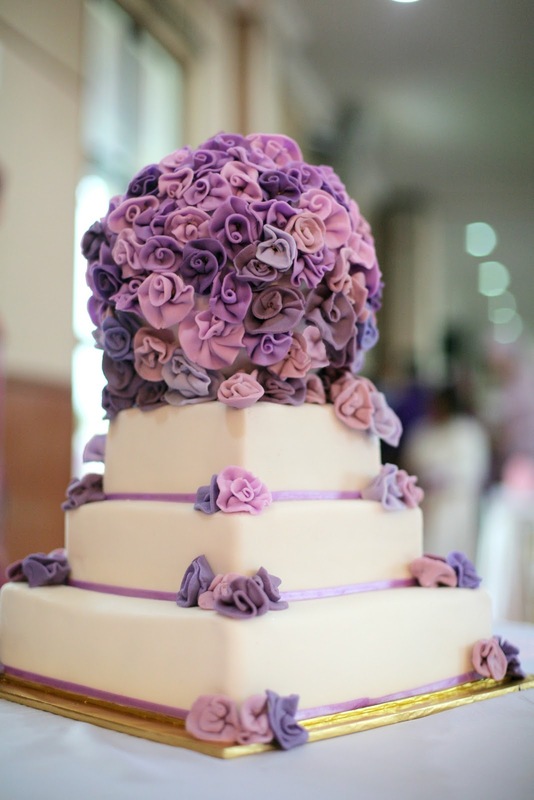 Then, there was a rainbow cake in purple shades hiding inside the bottom tier, hahah! Challenge to mom who baked the cake, can she manage to get the shade for the batter prepared? Would the shade remain after being baked? Last but not least, would the flower ball survive during transport? Should I set up the cake on the spot? My ultimate query would be "SHOULD I ACCEPT THE ORDER?" Aha! You know the answer by now. I'm glad that mom and I learned so much from the preparation, we had progressed further for sure! A big thank to Anis for giving us the opportunity! Wish you a wonderful marriage life ahead and blessed with lotsa love!